During the Golden Jubilee Year of India’s Independence, the Rashtriya Sanskrit Sansthan established Kendriya Sanskrit Vidyapeetha at Garli in the State of Himachal Pradesh. It is now renamed as the Garli Campus of Rashtriya Sanskrit Sansthan ( Deemed University ). The campus is presently ocated in a rented building. However, the Government of Himachal Pradesh has allotted a suitable piece of land admeasuring 2-63-18 hectares at Village-Balahar, near Pragpur, Tehsil-Dehra, District – Kangra (H.P.). The first phase of constructions over this site, including administrative block, classroom and library will be completed by the end of this financial year 2010-2011. Students from all sections of society are imparted instructions of Prak Shastri at Interme-diate level and in the subjects of Sahitya, Jyotisha and Vyakarana at Shastri and Acharya levels. Research programme leading to the degree of Vidyavaridhi (Ph.D) is also offered. 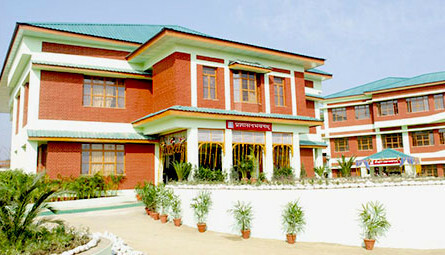 The subjects like Computer Education, Environmental Studies, Hindi, English and Histroy are also taught as a part of the course.